I’m less impressed with this novel than the author is with himself. As dazzling as the the story can be, (and it has a few genuinely great moments) it ultimately collapses in on itself. The never-ending onslaught of 1980s pop culture minutia and name-checking, reduces the entire novel to a level of superficiality of a Knight Rider episode. The characters are as flat and two-dimensional as PacMan. Ready Player One takes place in the not-so-distant future. The world has become a very bleak place, but luckily there is OASIS, a virtual reality world that has grown into an online utopia. People plug into OASIS to play, go to school, earn money, and even meet other people – or at least their avatars. 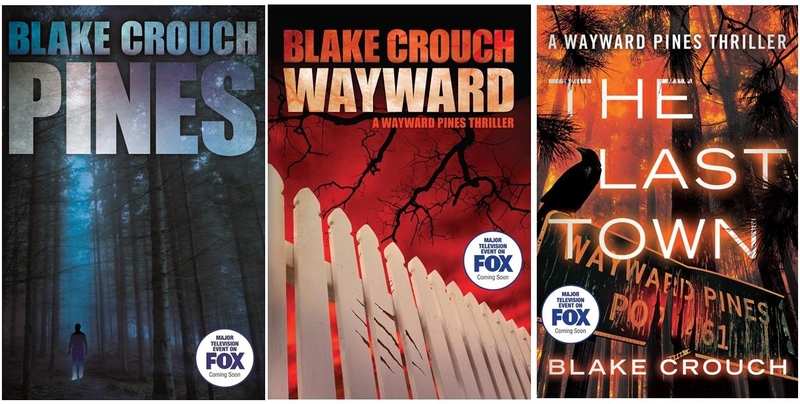 For Wade Watts it certainly beats passing the time in his grim, poverty-stricken real life. Along with millions of other world-wide citizens, Wade dreams of finding three keys left behind by James Halliday, the now-deceased creator of OASIS and the richest man to have ever lived. Halliday grew up in the golden age of the 1980s in the United States, and OASIS is an extreme (and fully enveloping) immersion in that decade, movies, music and most of all … video games. The keys are rumored to be hidden inside OASIS, and whoever finds them will inherit Halliday’s fortune. But Halliday has not made it easy – he has created real life dangers in his virtual world. All across the globe, players are exploring OASIS looking for the keys and suddenly one day, Wade discovers one and the international race is on! Wade, with the help of several other on-line avatars, challenge Halliday’s games, puzzles, and contests, with clues drenched in full tilt 80s nostalgia. I was not an 80s gamer kid (I grew up in the previous decade) so for me, a lot of this name-checking various geek/fanboy bits of 80s culture quickly became an irritating distraction of a fairly ingenious story. 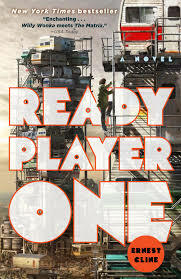 I got the impression that author Ernest Cline is that guy at a party who spends the entire evening trying to impress everyone by talking about and quoting endlessly every single song/movie/tv show/videogame he’s ever enjoyed. At some point you just want him to shut up! So finally, after 380 pages of being bombarded with more Journey and Rush lyrics that I needed to hear, or bad 80s movies I never wanted to watch again, or detailed descriptions of obscure video games I never played (or even heard of), we get to the conclusion. James Halliday’s avatar is waiting in the room which holds the last key – the key to his vast fortune. His avatar then lectures the winning player (come on, you think I was gonna tell you the winner!) and his advice is … (wait for it) … spend more time outside and less time playing video games! WOW. The only reason I didn’t throw the book across the room is because I read it on my Kindle and I didn’t want to break it. Sixty-five years ago one of the most famous and influential novels was published, Nineteen Eighty-Four. 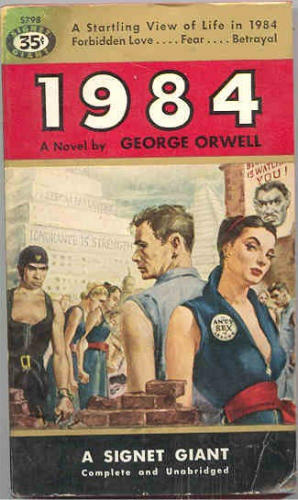 George Orwell’s dystopian novel introduced terms and concepts that have entered everyday use: Big Brother, doubl ethink, thoughtcrime, Newspeak and memory hole. The Oceanian province of Airstrip One is a world of perpetual war, omnipresent government surveillance, and public mind control, dictated by a political system euphemistically named English Socialism (Ingsoc) under the control of a privileged Inner Party elite that persecutes all individualism and independent thinking as thoughtcrimes. Their tyranny is headed by Big Brother, the quasi-divine Party leader who enjoys an intense cult of personality, but who may not even exist. Big Brother and the Party justify their rule in the name of a supposed greater good. Winston Smith is a low-ranking member of the Outer Party who works for the Ministry of Truth (Minitrue), which is responsible for propaganda and historical revisionism. Smith’s job is to re-write past newspaper articles so that the historical record always supports the current party line. Smith is a diligent and skillful worker, but he secretly hates the Party and dreams of rebellion against Big Brother. Everywhere Winston goes, even his home, the Party watches him through telescreens; everywhere he looks he sees the face of the Party’s seemingly omniscient leader, Big Brother. The Party controls everything in Oceania, even the people’s history and language. Currently, the Party is forcing the implementation of an invented language called Newspeak, which attempts to prevent political rebellion by eliminating all words related to it. Even thinking rebellious thoughts is illegal. Such thoughtcrime is, in fact, the worst of all crimes. 1984: Telescreens in every room. Programming runs 24 hours a day. Proles have no way to turn off their screens. NOW: Telescreens in almost every room. In everyone’s hands. Programming runs 24 hours a day. Proles rarely turn off their screens. 1984: Telescreens in all public and private places, so the populace can be watched to prevent thoughtcrime. NOW: Surveillance cameras in most buildings and public streets to prevent crime. People carrying tracking devices called cell phones. 1984: Lotteries with very few winners. Held to collect income for the state, and to give hope to the masses. NOW: Lotteries with very few winners. Held to collect income for the state, and to give hope to the masses. 1984: History is rewritten to conform with modern beliefs. All references to oldthink are removed. NOW: History is rewritten to conform with modern beliefs. Example: In the 2013 history textbooks, the 9/11 attacks are described as being committed by “terrorists.” No description of their Islamic extremism and hatred for Western beliefs. However, in the same book, Timothy McVeigh is described as a “radical right-wing terrorist.” There are too many examples to list here. You’ve probably already come up with 3 or 4 in your head. 1984: Songs are created by machines. No one can write a song not in line with Big Brother. No creativity is needed. NOW: Songs are created by synthesizers and digital samples.The creativity of past musicians are “sampled” by “artists” and re-mixed into a collage of mechanized sound. 1984: Telescreen is full of confessions of “Thought criminals.” They confess their crimes and perversions. NOW: Daytime talk shows are filled with people who enjoy sharing the low-rent, thuggish lifestyles with the rest of the world. So, if you have never read 1984, it would make a great (yet uncomfortable) summer read to discover what Mr. Orwell warned us about sixty-five years ago. And for the government bureaucrat whose job is to read this column, I hope you enjoyed it. I encourage you to purchase my books and read them also!